When decay spreads to the tooth’s inner pulp, a root canal treatment may be necessary to save it. It’s a common procedure: after removing all tissue from the pulp, the pulp chamber and root canals are filled with a special filling. The tooth is then sealed and a crown installed to protect the tooth from re-infection and/or fracture, possibly extending the tooth’s life for many years. 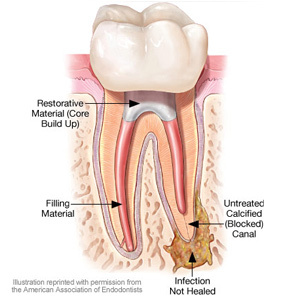 Sometimes, however, the tooth doesn’t respond and heal as expected: the number, size and shape of the patient’s root canals may have complicated the procedure; there may have been a delay before installing the final crown or restoration or the restoration didn’t seal the tooth as it should have, both occurrences giving rise to re-infection. It’s also possible for a second, separate occurrence of decay or injury to the tooth or crown to undo the effects of successful treatment. It may be necessary in these cases to conduct a second root canal treatment, one that may be more complicated or challenging than the first one. For one thing, if the tooth has been covered by a crown or other restorative materials, these will most likely need to be removed beforehand. In cases where the root canal network and anatomy are challenging, it may require the expertise of an endodontist, a dental specialist in root canal treatments. Using advanced techniques with microscopic equipment, an endodontist can locate and fill unusually narrow or blocked root canals. Because of these and other possible complications, a root canal retreatment may be more costly than a first-time procedure. Additionally, if you have dental insurance, your particular benefit package may or may not cover the full cost or impose limitations on repeated procedures within a certain length of time. The alternative to retreatment, though, is the removal of the tooth and replacement with a dental implant, bridge or partial denture with their own set of costs and considerations. The complications and costs of a repeated procedure, though, may be well worth it, if it results in a longer life for the tooth. Preserving your natural tooth is in most cases the most desired outcome for maintaining a healthy mouth.